The Comfort of Giving and the Courage to Fall; Tetsugaku Letra. | Isn't It Electrifying? The Comfort of Giving and the Courage to Fall; Tetsugaku Letra. You don’t only belong to yourself, you know? There isn’t a single being in this world that belongs only to themselves. Everyone has connections to someone else and shares something with them. That is why you can never be free. That’s what makes us feel joy, sadness….and love. -Yuuko, xxxHoliC Vol 8, Ch 51. 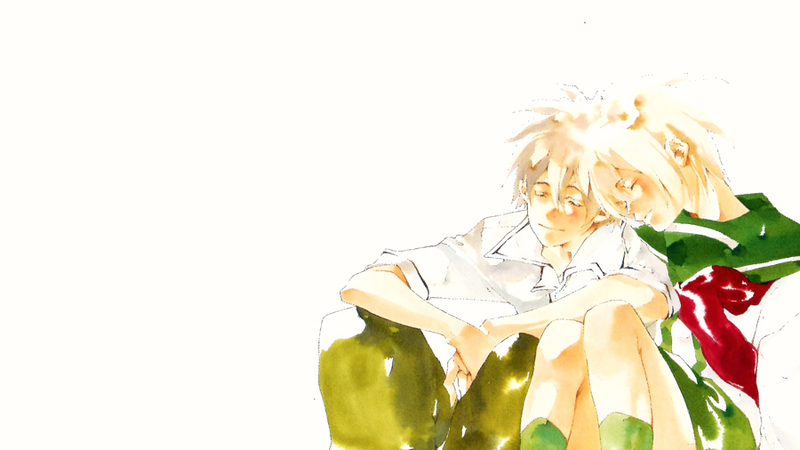 The first thing that catches your eye about Tetsugaku Letra is how delicately beautiful the art is. From the lush watercolor covers that capture the characters in their most free and soulful form, to the quiet moments of emotional resonance that reach out and leave something hard in your throat. Then there’s the awkward protagonist, a pair of shoes being exchanged, the rustle of a warm breeze as his journey toward self-redemption begins…. It sounds familiar, and there are plenty of things in Tetsugaku that you could find in manga like Aku no Hana, Koe no Katachi and Oyasumi Punpun. 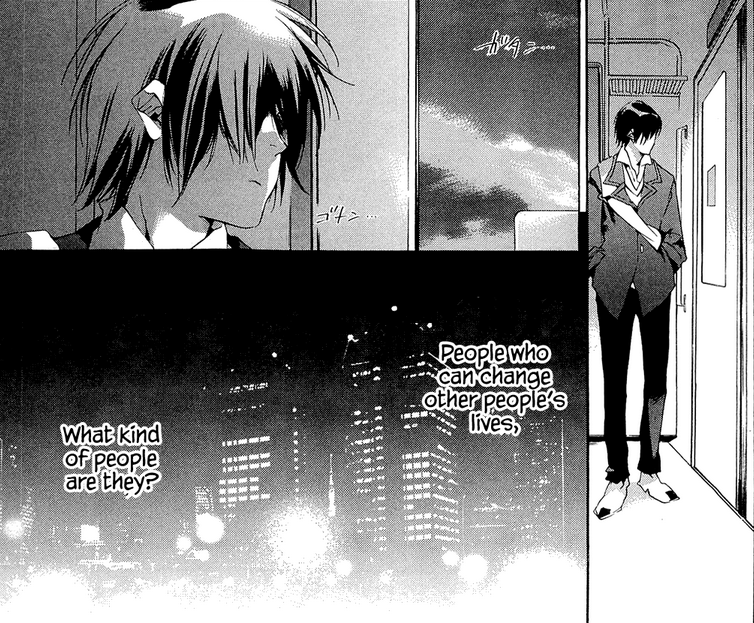 But I think Tetsugaku departs from stories like those in that it decides to tell the tale of people who are all intensely connected by a need to be wanted and shared by kindness. Kindness, a fragility that has disillusioned these youthful kids, has made them lose sight of their dreams, and have made them give up hope on ever achieving anything. There’s Ichinose, a boy who only wanted to shoot hoops for his life, only to be misled by how talent and experience works in the world. He befriends a chubby boy named Ichikawa who must discover how falling in love also means loving yourself, and a stoic delinquent named Hana who suffers from the trauma of puberty devastating his once high pitched and clean voice. There’s also an old woman who struggles with teaching, a younger sibling who must find the strength to face her own friendship fears, a lanky teenage girl attempting to play baseball despite not having the form…the list goes on and on. Every character is diverse and multifaceted which makes for compelling and different chapters. Tetsugaku Letra is also much easier to read, though not easier to bear – there are many beautiful but heart-wrenching parts in the story that strike a chord in my heart, and sometimes I have to look away. Some of the tales are hard, some of them are easy, but all of them are incredibly true, and ring close to home as a young adult trying to find a fresh pace of change. The common theme of learning how to forgive yourself and others ties all of them into the pulsing heart that breathes life into every panel, but what makes Tetsugaku so powerful is how it understands the feelings behind these stereotypes, smashing those conventions into pieces and ultimately portraying every human being as they are – conscious, weak people that struggle every day to understand themselves better and escape out of the holes they’ve dug for themselves. It’s a story I’ve seen in Koe no Katachi, but I think Tetsugaku just handles it with infinite grace and nuance to the point where it’s more captivating and easier to parse. Just some of many of the small truths Tetsugaku reveals in its story. A lot of the manga has a lovely aesthetic. Every frame is imbued with a soft shade of grey, allowing for solitary moments to be encapsulated by long gaps of white or the natural fall of highlight and shadow onto one’s face. There’s also a very neat focus on hand expression to convey the vulnerable nature of adolescence and that same action of giving and relying on other people. Fingers stretch out in relaxed positions as our protagonists slowly learn to rely on each other as they build their own confidence and better themselves. Palms open as they stumble, learning to get up and try again. 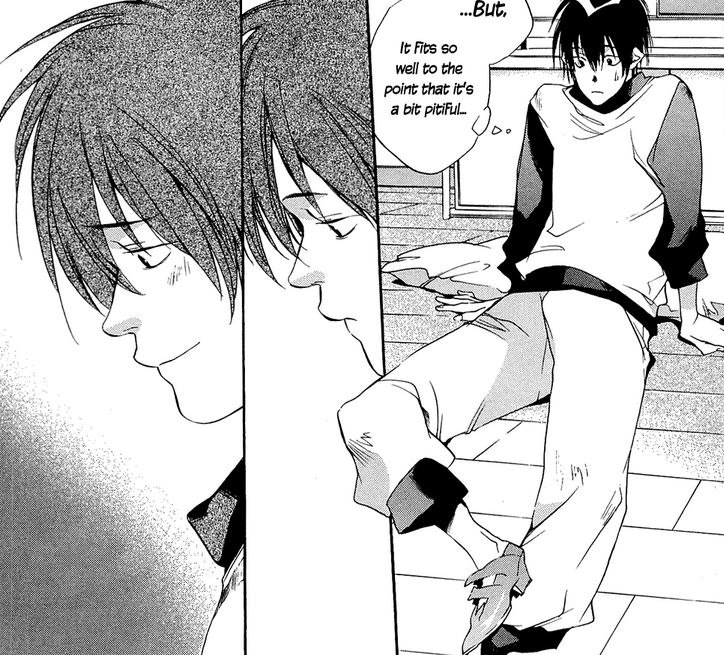 Ichinose too, learns to fall, but no longer into his own shadow. Instead, he falls – and dances – in the red slippers fate has given him, but the ones he has also chosen to wear and fit into. This ties in wonderfully with many of the themes Tetsugaku conveys through Spanish dancing – grow, fall, and find your natural form all in due time. Through the clumsy life he shares with his friends as they all move towards a hobby they care about, Tetsugaku tells us this: caring s not a sin, but rather a sign of inner strength. We share our hopes with the people we care about, in the hopes of being cared about in return. Perhaps that’s selfish, but that’s the only way we can go on living freely without regret. No one can ever live truly alone, but in cherishing the small moments in our lives – whether they be moments of sadness, pain, happiness, or love – and by choosing to open up ourselves to others (with the confidence and uncertainty that you may be stepped on and used) only then can we move forward to become the people we want to be. Stretch out your hand, show kindness to someone. Don’t be afraid to receive in return. Fall till you grow callouses on your palms. Those experiences may very well be the key to finding your happiness.